Express Sealcoating is the premier asphalt sealcoating company for all of your asphalt repair needs in Highland Park IL. We specialise in Driveway Sealcoating, Asphalt Repairs, Hot Rubbe r Crack Filling on Parking lots and Roads, Line Striping and Decorative asphalt seal coating designs. Each year we service thousands of driveways and hundreds of commercial properties as well. We are able to handle any size job from small driveway sealcoating to large commercial accounts managing multiple properties. We do more than just driveway sealcoating in Highland Park IL. If you need some specialized service or asphalt repairs we can give you a free estimate to sealcoat or repair part or ALL of your driveway. We offer line striping services for parking lots including new layouts, sealcoating, or restriping using the highest quality paint products available. We are very experienced in repairing drainage and sewer problems which require different solutions depending on the specific needs and grading issues. 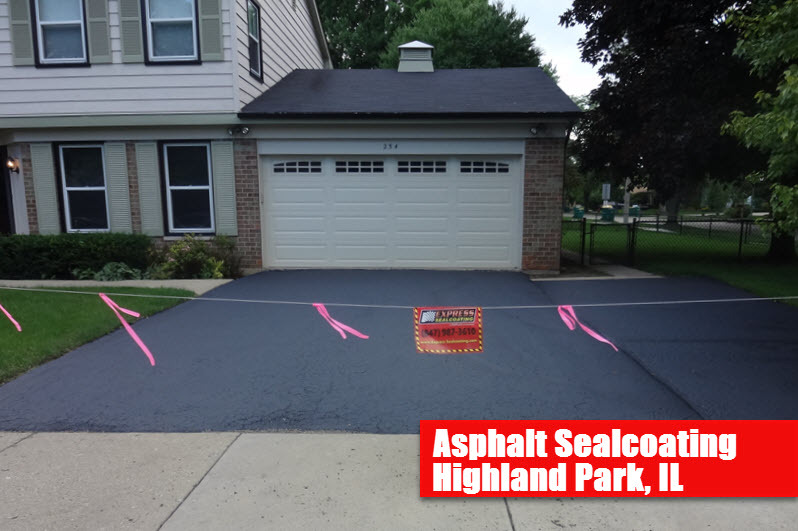 Our Asphalt sealcoating and driveway sealcoating services in Highland Park IL include treating Oil spots using a propane torch to lightly dry out the oil and then apply a high grade oil primer to improve adhesion of the sealcoating. Neatly brush apply 1 coat of 100% the highest quality Coal Tar sealer manufactured by Gem Seal, formerly Sakrete. (Silica sand is evenly mixed with the sealer for added Traction and Durability). Thorough cleaning of the entire asphalt surface and in cracks using wire broom to loosen up dried dirt and debris and then high powered blowers to clean off all dirt and debris. Highland Park’s Top Asphalt Sealcoating Company!